Have You Seen the "Voxmobile?" 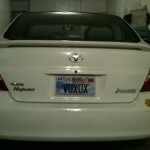 The team here at TelCentris is very devoted to Voxox. People wear Voxox t-shirts to work, use Voxox graphics as their desktop wallpaper, and, of course, use the service as their daily communication tool. But it looks like TelCentris Co-founder and Chief Information Officer Bob Hertz has us all beat with his new vanity license plate!